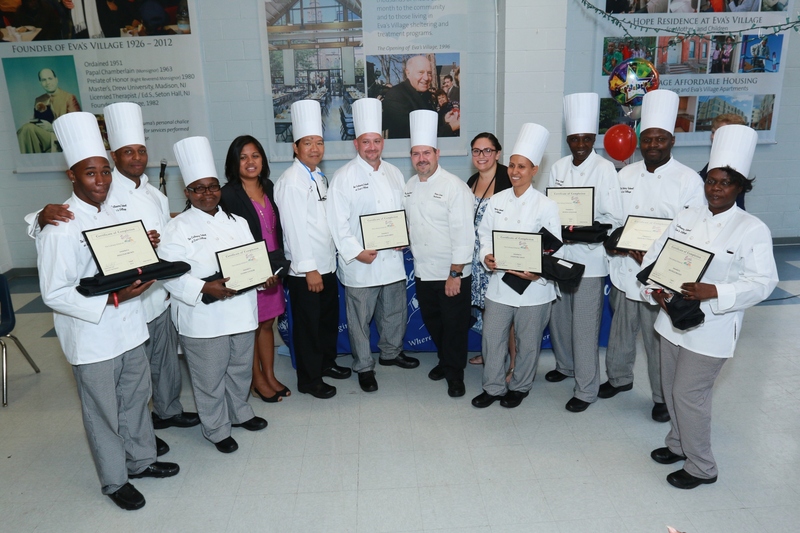 The Culinary School at Eva’s Village celebrated the graduation of its third class of students. After completing a five-month course providing fundamental cookery skills appropriate to basic positions in professional food preparation, eight students received their certificates of completion and enjoyed a reception catered by students from the fourth class in the culinary school. For application information on The Culinary School at Eva’s Village, contact: Donna Marie Fico, Director of Marketing & Education – Phone: (973) 523-6220 Ext. 230 or email Culinary.School(at)evasvillage(dot)org. To support The Culinary School at Eva’s Village or one of our other programs visit http://evasvillage.org/donate2.shtml. The five-month course provides fundamental cookery skills appropriate to basic positions in professional food preparation. Four-week modules include, Introduction to Culinary Arts/Breakfast Cookery; Buffet Prep/Short Order; Garde Manger/Pantry; and Introduction to Baking and Pastry Arts. Topics cover recipe and menu genres, culinary math, knife skills, safety and sanitation, and breakfast cooking. Students will also be coached in workplace readiness and life skills throughout the modules. As students advance through the modules they practice cooking techniques, including soup, stock, and sauce production, vegetable and starch cookery, and scratch preparation of salads and dressings. More advanced classes cover meat and seafood fabrication and cooking techniques, Garde Manger practices and baking and pastry cooking techniques and production. The final module includes a four-week industry internship with post-internship placement services. Eva’s Village (http://www.evasvillage.org), originally a New Jersey soup kitchen, was founded in 1982 by Msgr. Vincent E. Puma in response to the increasing incidence of homelessness in his Paterson, NJ parish. But Msgr. Puma soon realized that a soup kitchen was not enough. With the generous support of thousands of donors and private and government grants, Eva’s has grown to be the most respected anti-poverty program in New Jersey. Their mission is to feed the hungry, shelter the homeless, treat the addicted and provide medical and dental care to the poor with respect for the human dignity of each individual.